Once you’ve made the decision to build a Lead Scoring Model, there are a few things you will want to do to make the process as easy as possible. Our recent Eloqua User Group Meeting walked members through a few steps to help ensure you achieve the best possible outcome. 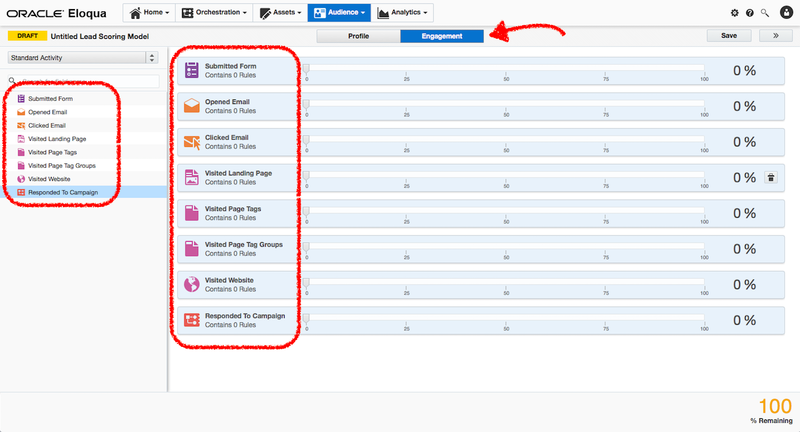 This is a screen grab from the ENGAGEMENT section of the Lead Score Model Builder. Click on the image above to get a closer look. *Visited Website: This means any contact who has visited any website you have the Eloqua tracking script installed on. This is not website page/url specific. Use Page Tagging for specific pages or groups of pages. ** Responded to Campaign: You control what defines “responded” and the priority of the response type. e.g. you may see that a Form Submission is of higher value than Opened an Email. Your Eloqua Administrator can set these for you. A page tag is a tool which allows you to mark or categorise a page or groups of pages on your website to gain more valuable tracking, contact or visitor segmentation, and reporting. Think of a page tag as a bucket that has a particular theme to it. Page tag values are the items within that bucket that fit that theme. Much like in a department store, you may have a section for socks, but within that section you will find racks for different brands and styles (white, low-cut, black, and so on), some more valuable to you than others, and they are labeled accordingly. The concept for page tagging is similar except it applies to your website and the labelling is totally customised so that you only mark the “racks” you want to know have been visited. For example, you may create a “Possible Prospect Type” tag and that might contain values of “Enterprise,” “Small Business,” and “Reseller,” each value being associated with a particular page or pages. Or a “High Value Web Content” tag might include values of “Contact Us Pages,” “Pricing Pages,” and “Product Whitepapers.” Or you could just mark the pages that dealt with pricing with a Pricing Pages tag. This allows you to identify, with greater ease and in more business-relevant terms, what your website visitors are accessing and then provides a more intuitive way of segmenting and scoring those visitors. Involve the Sales team in the design phase of your lead scoring model and in the process to define a Marketing Qualified Lead. If you’re a multi-national Eloqua customer, or have multiple brands using the same instance of Eloqua, work out a folder structure/filing system that will make sense as you build your model. Determine a regular review period for your lead scoring model. Having the same lead scoring model in place for two years, is probably as effective as winking at someone in the dark. Business changes, your prospects change and what’s important to both, changes. Make time to review your Eloqua Website Reports to ensure you have clarity around your busiest pages. However, overlay this with additional data so you know which of your website pages are in fact High Value Web Content (HVWC). Using Google Analytics (GA) in concert with your Eloqua Website Reports will put you in a solid position to understand how your website is performing. Map website pages and Eloqua landing page visits to a sample group of contacts who have recently purchased. Try to determine any common behaviours so you can score and weight page visits accordingly. To assign leads or not? Which is it? Sales & Marketing: BFFs or Frenemies? Choose your focus topic from below.